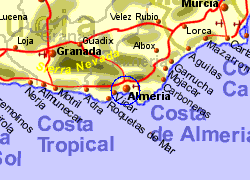 The city of Almeria lies at the south east corner of Spain, an area that possibly has the best climate in the country. The city was important in the time of the Moors, and is still overlooked by the impressive Arab Fortress, the Alcazaba. Rail connections have not been anything to shout about in the past but there is the promiss of a high speed link in the future. 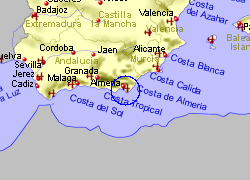 Motoways to the north and north east are good but the link along the coast to Malaga is still not complete. Within easy reach of Almeria are the Costa de Almeria and Costa Tropical coastlines, the Sierra Nevada and the Alpujarras, plus the attractions at the old Spaghetti Western film studios in the Tabernas desert. 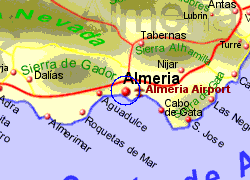 Map of the Almeria area.